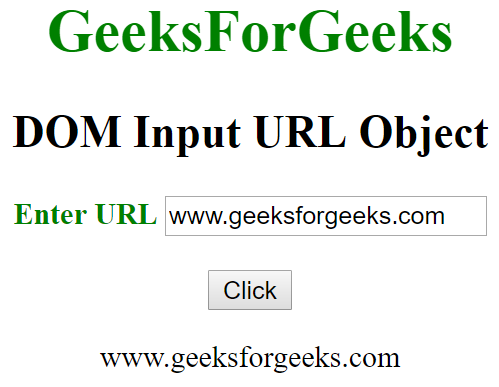 The Input URL object in HTML DOM represents an <input> element with type = “url” attribute. The element with type url can be accessed by using getElementById() method. where id is assigned to the <input> tag. list: It returns the reference of data list that contains the URL field. form: It returns the reference of form that contains the URL field. autocomplete: It is used to set or return the value of the autocomplete attribute of a URL field. autofocus: It is used to set or return if the URL field should automatically get focus when the page loads. 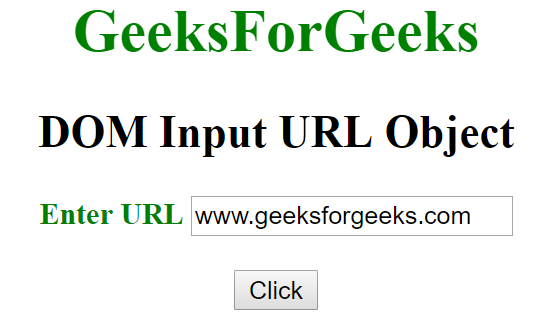 defaultvalue: It is used set or return the default value of a URL field. 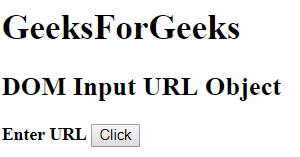 disabled: It is used to set or return whether a URL field is disabled or not. maxLength: It is used to set or return the value of the maxlength attribute of a URL field. name: It is used to set or return the value of the name attribute of a URL field. 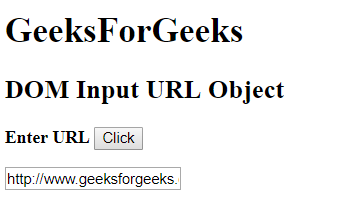 pattern: It is used to set or return the value of the pattern attribute of a URL field. placeholder: It is used to set or return the value of the placeholder attribute of a URL field. readOnly: It is used to set or return whether the URL field is read-only or not. required: It is used to set or return whether the URL field must be filled out before submitting a form. size: It is used to set or return the value of size attribute of the URL field. type: It returns the type of form element the URL field belongs. value: It is used set or return the value of the value attribute of a URL field. <input type = "url" id = "gfg"